But freeing because I see that it’s okay to not have the answers to most of life’s questions, to admit that at times I have no idea what I’m doing. This being a gardening website, I’ll leave the philosophy mostly aside for today (although having been learning a bit about Buddhism lately, it seems to me he’d been heavily influenced by Buddhist teachings). But his book taught me a lot about gardening, and has clearly influenced the permaculture farming movement, too. 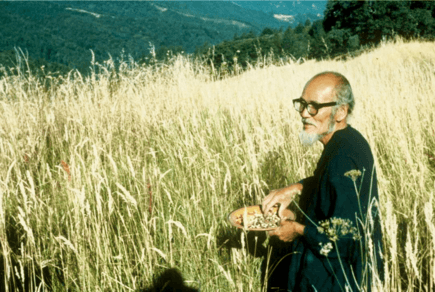 For much of his long life, Masanobu Fukuoka farmed in Japan using a method he called “natural farming” or “do-nothing” farming. Tilling. Don’t till/cultivate the soil. Fertilizers. Don’t use chemical fertilizers or even much compost. Weeds. Don’t do much weeding or spray herbicides. The title of his book ‘The One Straw Revolution’ refers to his idea that if we were to grow food by working with nature, including returning all organic matter (such as straw from grains) back to the soil, we’d be a whole lot better off. So What Did Masanobu Fukuoka Do? Tilling. Instead of tilling to make a seed bed, he sowed his seed right on top of the soil. He actually combined his seeds with clay and compost and rolled them into individual balls for sowing seed (doesn’t take as long as you’d think) in order to protect the seeds from birds and give the seeds a suitable growing environment when the rain washed away the soil ball surrounding the seed. Fertilizers. Instead of using chemical fertilizers and compost, he used straw and manure and cover crops (especially clover) for his fertilization, which also suppressed weeds, plus the cover crops invited beneficial insects/animals. He thought chemical fertilizers and compost to be generally not in line with nature. Weeds. Instead of tilling to control weeds, he flooded his fields with water (as is done when growing rice), which also weakened the weeds. He’d cut them back manually when absolutely necessary, at least in his vegetable patch, but otherwise allowed them to grow because weeds are often very beneficial. Pesticides. Instead of spraying pesticides, he allowed pests and diseases to stick around and even take out a small part of his crop in order to encourage their predators to come in and eventually strike a balance. As the system became healthier and more biologically diverse, pests didn’t cause much problem anymore. Tilling. There’s controversy around tilling. My perspective is that sometimes it’s a good idea and sometimes not. Personally, I may choose to till/double dig the first time I create a small garden if I want to incorporate compost and organic fertilizers. In the long run, I tend to focus more on mulching on top of the soil as Fukuoka did, rather than tilling. Some gardening approaches such as the biointensive method advocate for annual deep digging and it works well for them, while others such as lasagna gardening/sheet mulching would go for little to no soil disturbance. I could go on about this, but the bottom line is one or the other or a combination will be right for you. Fertilizers. If you’re not in a hurry to produce nutrient-dense food, you can indeed let nature do the work of balancing your soil (even Fukuoka had many years of setbacks before it started to work out for him). If you’re in more of a rush, fertilizers and compost are a huge help – mostly that means organic fertilizers. Many of us are working with such worn out soils that it’s become clear to me that some external inputs are very helpful. Weeds. Sure, let them be as long as they’re not overpowering your plants. Weeds are there to improve your soil, so it’s fine to leave them. If you don’t like the look of them, it would be nice if you could compost them or use them in your mulch, and then perhaps plant something more desirable to keep your soil covered, such as strawberries. Pesticides. I don’t use chemical pesticides, and mostly don’t use organic pesticides either. I get occasional emails from people asking me about X organic herbicide or Y organic insecticide, and I can’t offer too much advice because I just don’t use products like that. Even organic pesticides will harm the beneficial insects/fungi/plants in your garden, so I tend to stay away. My preference is to create healthy plants and soil so the pests and weeds don’t really cause much trouble. If I lose a few plants to pests, that’s okay because they were obviously very sick plants to begin with, not really fit for eating anyway. If the weed is a true weed, then it will gradually disappear when you balance the soil. However, in Texas we have a forage crop that’s our biggest weed. It’s called Johnsongrass. It’s a high protein forage crop. The richer you make the soil, the better it grows. It has deep rhizomes. It’s really difficult to control this plant mechanically. It uses huge amounts of energy. This is a case of “does nature approve?” I just about wore out a tractor trying to control this plant when it would have been so easy with glyphosate [Roundup] applied at the right time. Sometimes you have to weigh things up. I talked to Elaine Ingham about what happens to glyphosate and she said that the bacteria eat it right up as long as you still have the life in your soil. The warmth of the soil is also important. It only takes three days in a good Texas soil to get rid of Roundup, but it can take up to 18 months in Canada, where the soils are cold. I also talked to Dr Don Marks. He was the first guy to really do a lot of research on mycorrhizal fungi. He has won all kinds of awards for his work. I asked him, “If I was trying to protect my mycorrhizal fungi, would you rather me fight the Johnson Grass with a plough or herbicide?” He said, “When you plough, you destroy the host and you tear the mycorrhizal fungi apart before they get a chance to spore. When you use glyphosate as soon as that plant stops photosynthesising and not delivering sugars to the fungi, it immediately puts out spores.”You think about it, which would nature approve? Me, putting all that carbon dioxide into the air, wearing out a tractor, oxidizing all of that carbon from the soil or using a little glyphosate in the right way? Forget organics – let’s look at nature. If you have to use glyphosate, use it at night to avoid drift with the thermal rise in the morning. I use an ounce of molasses per gallon of mix. It acts as a sticker but it also provides energy for the microbes to break down the glyphosate. Hmm, makes you think right? And yet I emailed two people who are very knowledgeable about mycorrhizal fungi (the manufacturer of the fungi I use and the manufacturer of another very high quality mycorrhizal product). They both disagreed with many of the assertions made by Beck/Ingham/Marks, and although they didn’t say so directly, I inferred from their responses that they probably disagree with that rational for using glyphosate. Tilling. Has advantages and disadvantages. May or may not be appropriate for your situation. Fertilizers. Most chemical fertilizers offer more problems than benefits, but as you guys know, I’m a proponent of compost and these few organic fertilizers, especially in the first few years of a garden. Weeds. Are mostly beneficial, and I will add here that they’re often medicinal, so only control them when they’re cause real problems, or when you just don’t like the look of them. Pesticides. As with chemical fertilizers, most pesticides offer more problems than benefits, so I don’t use them. Interesting that most commenters are focusing on the glyphosate issue from Mr. Beck rather than the rest of the article, which is all about not using chemicals. Some good points you guys are making and some I disagree with, but that’s okay – that’s what comments are for. On my end, it’s Sunday morning, I’m getting ready to head off to a meditation and I just don’t feel like getting into a big discussion about it, so I’m not going to respond to each comment. Feel free to debate amongst yourselves – just please be respectful of each other. Hi Phil, Dr. Marks has some flawed advice here. I’m saddened by his response. When I took the Organic Master Gardener Course with Gaia College there was no point where the facilitator or the book by Heide Hermary, Working with Nature advised to ditch organic practices and use chemicals. This is a truth which I have held even prior the course, but reinforced by the science behind the education. I’m afraid some of your readers are going to misinterpret your response as your agreeing with this ….I know you have been educated by the same instruction and don’t believe in the use of chemicals. I’m not familial with this man but I know his advice is WRONG. Anyone who has won numerous awards for his work by the scientific community is suspect in my books. AMF are NOT so easily destroyed by tillage. They are destroyed by chemicals and salt based fertilizers. Research has proven that no till operations have less AMF than there organic neighbors BECAUSE of the chemicals that are applied. Read the research from the U of S. If you till every time you see a weed as is the practice of some farmers, AMF populations will fall. Anyone who suggests that microbes eat roundup are disillusion at best! Roundup ties up nutrients, has a half life of 23 some years, accumulates in the soil even though Monsanto says it doesn’t. It appears to disappear, however any application of phosphorus will stimulate its union. Read Dr. Huber’s work, or Dr Arden Anderson, the list goes on and on. Glyphosate is just bad. By the way, Monsanto just registered the stuff as an antibiotic. Possible advice for our Texan friend would be to apply AMF to soil after each tillage operation. However, he will ALWAYS have problems unless he fixes the soil. Johnson grass grows well in soils that have no low available calcium, high potassium, high magnesium, low humus, and low beneficial bacteria. I am 100% organic and believe it is the very best way to go. That said, if ANY of the claims about glyphosate and GMO’s are proven scienticifically true they would have been long since banned. Stuff is banned all the time. The problem is no one is offering scientific evidence. Dr Huber is known to duck and leave the room when challenged. The biggest problem may be money to have scientific test done, I don’t know. All testing done so far have been considered junk science. Would I use either? Absolutely not, glyphosate- there are alternatives that may be safer, GMO creeps me out, they are trying to play God. I have mostly henbit and chickweed growing in my garden. I have noticed that where I have left the weeds, the plants I put in are thriving. Where I have eliminated them, those plants are so-so with the exception of chives. I am allowing weeds as an experiment having noticed my flowers do better when there are weeds. Would like your opinion, Phil. Most weeds are highly beneficial in the garden, as long as they aren’t competing too much with your plants. They improve the soil and invite beneficial organisms into the area, among other things. Definitely feel free to leave the weeds and only control the ones that get too big. Thanks, Phil, I appreciate all your help immensely. It’s my understanding that glyphosate is not a chemical like other herbicides in the past. You can read some very damning information about it below. And if you click on “Dr. Don Huber” and watch that video I think you will be quite wary of using it. It’s a shame what GMO’s have done to our environment. The French Parliament just banned GMO maize. Good for them. G’day Phil, thanks for the pearls of gardening wisdom. You have inspired me to grow organic. How do I deal with onion grass?Chris, Geelong, Victoria, Australia.Stay happy. If it is indeed onion grass, I would let it grow and use it in the kitchen – plus it adds some beneficial diversity to the garden (make sure it’s onion grass though, as there are some similar plants that are highly toxic to eat). If you want to get rid of it, you pretty much have to dig it up to get the bulbs out, which does persistence because each little piece of bulb left in the soil will produce more grass. Sorry, but Muster Beck can stick this rotten advice you know where. We really don’t need MORE reasons to use RoundUp. Terrible. You are saying roundup is ok to use? You should buy a microscope and see for yourself how it kills the very microbes you are trying to build. 3 days for it to dissipate in your dreams. With soil tests we have conducted even after 6 months the soil was dead. These tests have also been confirmed by the CSIRO. in Canberra. Do some proper research and not from some one that is most likely on the take from Monsanto and the like. Shame on you for calling your self an Organic Gardener. Barry Hocking. It’s worse than it seems. Apparently only 2% of Roundup is broken down in the first few days. The rest is absorbed and appears in foods for humans. Humans don’t have the body chemistry that is destroyed by roundup residues – so according to Monsanto, that makes it right. Wrong, 90% of the cells in our bodies are not our own, but microbes. We need these microbes to remain healthy and stay alive. Bacteria have the chemical cycles that are destroyed by Roundup, so they die. In the past antibiotics have been killing our probiotic bacteria. Now Roundup has joined the attack. Haha Gardenmonk…I love the quote. It is true that there are a lot of ideas, philosophies, techniques and experiments to turn ones head on a “new” approach. I find Phil’s advice and his course to be well grounded and is mostly all I pay attention to (although I am still learning.) But your quote was perfect…somethings we can study too much on a topic where there exist such variability from one garden to the next when practicing organic gardening.Thanks for sharing the quote which I will use from time to time if you don’t mind? I’ve read Mr. Fukuoka’s book. I’d like to try his method of rolling seed in clay…but what kind of clay, and where might I find it? Bentonite clay is good. You can find it online or in supply stores for a few different uses – best to search online.But personally, I have enough clay in my soil to just use my soil, so you might try that.